Welcome to Prairie Story Recipe Swap Thursday! The most popular recipe from Recipe Swap Thursday last week was The 3-Minute Cookie @ The Country Cook. I've made variations of these and you really can't go wrong with salty sweet combo! This week I'm sharing my Chocolate Peanut Butter Reese's Pieces Cookies. These are sooooooo good and with only 5 ingredients, under 5 minutes to mix and 8 minutes to bake, you should be making these right now! 1) Link directly to your recipe. Scroll down to "Click here to enter" button. You will be prompted to enter the URL (link directly to your post), Name of your recipe, and Email (not visible), and then select a Thumbnail to upload. 2) Visit the other recipe links!! 3) Please include a link back to Prairie Story so everyone can see all the delicious recipes. Feel free to grab the Prairie Story Recipe Swap Thursday badge, or Tweet/Facebook this swap to your friends and followers. Thank you to all recipe swappers, blog hoppers, my loyal readers, Twitter and Facebook followers, fellow foodies, family and friends for your support. I'm so happy to be able to share my Prairie Story, and appreciate that you take a precious moment or two out of your busy day to visit my blog! Yum. The cookies look delicious. I'm avoiding sugar right now, but one of these days I'll have to give them a try. I have a page on my site that lists more than 250 hops, memes, and photo challenges… some for each day of the week. Check under the header for the link to that page. I’ve also started a BlogFrog community that focuses on hops, carnivals, memes, and photo challenges. Go to http://theblogfrog.com/1504201 to visit & participate. I just found your blog and I am loving it! I linked up today with my Pasta Weesie recipe and I hope you'll stop by some time. I look forward to reading more. Those cookies look awesome. 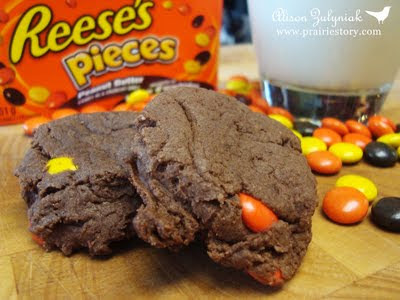 I am making them right now! OMG those cookies look good! I don't eat sweets very often but when I do it is usually those Reese's Pieces. I can only imagine how good they would be in chocolate cookies. Oh boy, those cookies look so good! And I like the three minute cookies too - yum! Thank you for sharing them both, and for hosting. I've shared some wonderful brownies I discovered on a visit to the Robert Mondavi winery in St Helena, California. They are a real (grown up) treat! These cookies look fabulous and I am going to make them tonight for my family! Thank you for sharing and hosting!! © Prairie Story care of Alison Zulyniak, 2010-2013. Awesome Inc. theme. Theme images by Ollustrator. Powered by Blogger.